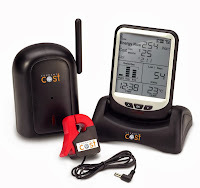 Is Your Solar Power Monitor Measuring Electricity Consumption? A lot of homes with SOLAR POWER MONITORING via bluetooth or wi-fi connection from the inverter, lack home electricity consumption monitoring. And where net metering is installed at the property, your home electricity consumption and solar generation are both as important. You really need to know them both! If you know what you are generating but not consuming in a net metering environment, how do you maximise the gain of your system. Could you be letting valuable energy slip out to the grid at only 8 cents per kilowatt? Could you be using more electricity from the roof, when it could be worth up to 55 cents on a TOU tariff? How do you know you are not using more electricity than is being generated, meaning you are now importing electricity? You could use less now and more later, but when? It is with no answers to questions such as this, that prove there is no way you can efficiently manage the cost effectiveness of such a system. Simply put if you are generating electricity and have no idea of the power consumption, then you are losing out as you do not have the necessary tools to know otherwise. By adding a simple ELECTRICITY MONITORING SOLUTION to your house, for the purpose of measuring the electricity consumption, then of course you are now in a position to make the best decisions based on generated electricity and consumed electricity. To learn more about the monitoring and analysis of your electricity usage and solar pv system's output, visit our ONLINE ELECTRICITY MONITORING page, where we make the task of getting your data online, very easy.